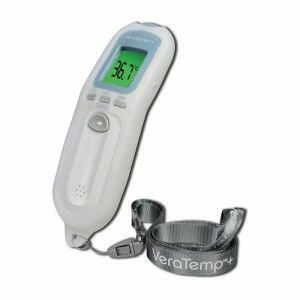 The VeraTemp+ Professional use non-contact thermometer has been created using the most advanced infrared technology with accuracy as the number one priority. The VeraTemp+ has been clinically proven to be as accurate as ear, oral and rectal thermometers. Each thermometer is tested 30 times to be within +/- .2oC (.4oF) accuracy, providing Health Care Professionals with instant, accurate and hygienic results every time. It is designed to be used in fast paced environments such as Hospitals, Clinics, Long-term Care Facilities, Schools and other public settings.